The Caring for Creation group at St. Joseph the Worker will be sponsoring a Green Fair on Sunday, April 28 from 9:00 a.m. until 12:30 p.m. in St. Joseph&apos;s Hall. There will be master gardeners from the U of M on hand to give you advice on your spring planting, exhibits from various environmental groups such as MNPCA, as well as green artwork and food and beauty products made from natural, organic sources that can be purchased. To participate as an exhibitor or vendor, please contact Stephen Kriz at (763) 354-9580. Over the next month or so, you may notice the information posted about plastics in St. Joseph&apos;s Hall. You may also notice that a lot (no, really, a lot) of plastic isn’t recycled properly. There are some ideas of more things you can do to help, but we tend to forget that we already have resources for things we can do. While you may be recycling, there are a lot of things you may not know you can recycle. Or there may be things you’re attempting to recycle that may be doing more harm than good at your local recycling center. Research suggests the average person swallows up to 68,415 plastic fibers each year from plastic dust particles landing on their plates. The average person also ingests about 100 plastic particles each year from shell fish remnants of microplastic from water pollution.Tests reveal bottled water contains an average of 325 pieces of microplastic particles per liter. To reduce these health hazards from plastic contamination, reduce your personal use of plastic bottles and other plastic items and petition companies to reduce their single-use packaging.Every change makes a difference. Decades of poor waste management practices and inadequate government policies have allowed huge amounts of plastic waste to be dumped directly into the ocean and led to an international pollution crisis that threatens each of the world’s oceans. Did you know that around the globe there are 5 massive patches or “gyres” of marine plastic? These huge concentrations of plastic debris cover large swaths of the ocean; the one between California and Hawaii IS THE SIZE OF THE STATE OF TEXAS. At a bird sanctuary on the Hawaiian island of Kauai, there is a bird sanctuary and nature museum displaying a dead Albatross showing all the plastic it had consumed. There were plastic cigarette lighters, parts of a flip-flop, plastic bags, pieces of plastic toys and plastic water bottle caps inside the dead bird. When the bird’s stomach became too full it couldn’t eat and it died of starvation. This should sadden and shock us all, as this is God’s creation and his creature. This is only one of the many consequences of plastic pollution. If you would like to learn more about plastic pollution and what we can do to reduce it, we invite you to join us at our Caring for Creation meetings held once a month at St. Joe’s in the library from 7:00 PM to 8:30 PM. For dates and more information on this ministry, please contact Steve Kriz at s.kriz@comcast.net. Here is something interesting. Have you heard of Microbeads? How about Microplastics? There is a difference, but both pose a serious threat to life of all types. Microplastics are defined as very small (less than 5 mm in length) pieces of plastic debris resulting from the disposal and breakdown of consumer products and industrial waste. The source of these Microplastics can be any item, large or small, from plastic bags to straws to toys or food containers. When plastic products are not disposed of properly (such as recycling), they end up in the environment where sun, water and other elements eventually break them down into tiny particles. These toxic particles never fully disappear but end up in our waterways, oceans, soil and our food chain. Microbeads are defined as manufactured solid plastic particles of less than 1 mm in their largest dimension. They are most frequently made of polyethylene, or other petrochemical plastics. Microbeads are used in products such as personal care, toothpastes, detergents, cosmetics, and others. These toxic particles are washed into our water systems making their way into our food and drinking water. Another troubling source of these tiny plastic particles is clothing made of synthetic fibers such as polyester and nylon! This category is labelled Microfibers. When washed, this clothing sheds plastic fibers which in turn slip through filtering devices to end up in waterways and eventually our seafood food chain. Plastic is used in a myriad of products and has been for decades. That production continues and continues to threaten and contaminate us and our environment. Please educate yourselves on this subject. Look up “The Story of Microfibers” on youtube; search “Microplastics in the Marine Environment”; explore beatthemicrobead.org. You can help by considering your purchases of plastic products. Remember to Reduce / Refuse / Reuse / Recycle / Remove. For information on joining the Caring for Creation team contact Steve Kriz at s.kriz@comcast.net. Decades of poor waste management practices and inadequate government policies have allowed huge amounts of plastic waste to be dumped directly into the ocean and led to an international pollution crisis that threatens each of the world’s oceans. Did you know that around the globe there are 5 massive patches or “gyres” of marine plastic? These huge concentrations of plastic debris cover large swaths of the ocean; the one between California and Hawaii IS THE SIZE OF THE STATE OF TEXAS. At a bird sanctuary on the Hawaiian island of Kauai, there is a bird sanctuary and nature museum displaying a dead Albatross showing all the plastic it had consumed. There were plastic cigarette lighters, parts of a flip-flop, plastic bags, pieces of plastic toys and plastic water bottle caps inside the dead bird. When the bird’s stomach became too full it couldn’t eat and it died of starvation. This should sadden and shock us all, as this is God’s creation and his creature. This is only one of the many consequences of plastic pollution. If you would like to learn more about plastic pollution and what we can do to reduce it, we invite you to join us at our Caring for Creation meetings held once a month at SJTW in the library from 7:00 to 8:30 p.m. For dates and more information on this ministry, please contact Steve Kriz at s.kriz@comcast.net. Virtually every piece of plastic that was ever made still exists in some shape or form (with the exception of the small amount that has been incinerated). It takes 500-1000 years for plastic to degrade. Refuse single-serving packaging, excess packaging, and plastic utensils.Carry reusable utensils in your car or purse to use at take out restaurants. Avoid sandwich bags and juice cartons by replacing them with reusable lunch bag and thermos. "Over the last 10 years we have produced more plastic than during the whole of the last century..."
"The average American throws away approximately 185 pounds of plastic per year." 1. Go digital! No need for plastic CDs, dvds, and jewel cases when you can buy your music and video online. 2. Bring your to-go mug with you to coffee shops or restaurants. Refuse lids, straws, and plastic cups. Plastics in the environment pose an increasing risk to human and animal life on our planet. Most of us are aware of some simple ways to reduce our plastic use, such as using a stainless steel water bottle instead of buying water in plastic bottles and using a reusable coffee cup when leaving home. Here are a few more ideas to help reduce your plastic use. 1. Use wooden matches instead of plastic lighters. 2. Make fresh squeezed juice at home and avoid buying juice in plastic bottles. 3. Refuse plastic straws in restaurants. 6. Purchase foods like cereal, pasta and rice in bulk and use your own reusable containers. 7. Use a razor with replaceable blades, not disposable razors. Also, if you have plastic containers or bags at home, reuse them rather than throwing those away and buying replacements. Please consider join the Caring for Creation Committee at St. Joe’s. We meet once a month for discussion, education and planning for our Green Fair in April of 2019. Contact Steve Kriz with questions about the group at 763-354-9580 or e-mail at s.kriz@comcast.net. DO YOU KNOW ALL THE ACTIONS CARING FOR CREATION HAS TAKEN IN 10 YEARS? The Caring for Creation team was started in 2008 as an off-shoot of our Social Justice Group, with support and encouragement from Roxanne Smith. The group’s purpose is to educate about how we can help care for God’s beautiful creation, Earth. The members of the group also educate ourselves on climate change and how we can implement changes in our personal lives to become more thoughtful in the ways we live, to become more energy efficient and dispose of our trash in the least damaging ways. It is now a group of 7 people and hopes to continue to grow. These are some of the actions the group has taken in ten years. Hosted Will Steger to speak at St. Joe’s, followed by a Q&A session. He spoke on climate changes in Arctic. Hosted author Jack Nelson-Palmyer presentation who spoke to us about his book, “Authentic Hope-It’s the end of the world as we know it but soft landings are possible” and we had a Q&A with him as well. Hosted a discussion with J. Drake Hamilton who is science policy director at Fresh Energy, an independent, Minnesota –based nonprofit organization working to speed the transition to a clean energy economy. Screened the documentary, Days of Living Dangerously, an American television series, followed by Q&A. 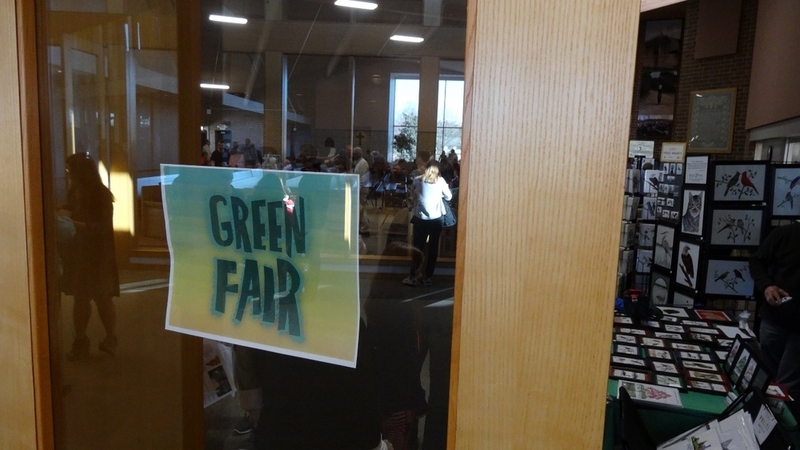 Hosted 4 Green Fairs in 2008, 2012, 2016 and 2018 at St. Joe’s. Did a letter-writing campaign to local restaurants regarding use of paper vs. Styrofoam for take-out. Partner with faith formation classes to provide information on caring for creation topics or to work on projects together. Partnered with the Garden Ministry to clean up outside compost and dumping area in 2014. Created and maintain the Caring for Creation bulletin board inside entrance 2, since 2014. Caring for Creation Group read and discussed two books: “On Care for our Common Home” by Pope Francis and “Caring for Creation”by Mitch Hescox and Paul Douglas. Applied for and won a grant from Hennepin County to begin an organic recycling program at St. Joe’s in 2015. If these activities sound interesting to you and you are concerned about climate change and caring for our planet we invite you to join our group which meets once a month, except over the summer, at 7:00 PM in the church library. Are we fulfilling Isaiah&apos;s prophetic visions when he stated? they have disobeyed the laws,violated the statutes and broken the everlasting covenant. Therefore a curse consumes the earth: it&apos;s people must bear the guilt. Water is a Matter of Life and all of us are at risk. Ensuring pure water for all people would be considered a basic right for us in the United States. However, on a global scale , water resource are quickly becoming privatized. Privatization refers to water for those with the financial resources ---not encompassing the general public. Should we be buying water from companies that bottle it and sell it?? Not to mention they are in plastic bottles that most of them end up in environment. both land and ocean..where it stays ... forever or is eaten by fish and birds as it turns to small pieces. The Caring for Creation Group meets monthly at St. Joe’s. We read, study, talk about environmental issues and then take actions to help our beautiful planet heal. We want to leave a cleaner, healthier Earth to our children, their children and all the children to come after us. If you have questions about Caring for Creation please contact Steve Kriz. All-powerful God, you are present in the whole universe and in the smallest of your creatures. You embrace with your tenderness all that exists. Pour out upon us the power of your love, that we may protect life and beauty. Fill us with peace, that we may live as brothers and sisters, harming no one. Oh God of the poor, help us to rescue the abandoned and forgotten of this earth, so precious in your eyes. Bring healing to our lives, that we may protect the world and not prey on it, that we may sow beauty, not pollution and destruction. The Earth is not a platform for human life. We’re not on it but part of it. It’s health is our health. We are proud of our amazing state. Minnesota is one of the nation’s leading states for wind power, and wind made up 18 percent of the state’s electricity generation last year, up from 13 percent from 2011. Renewable energy jobs, most in wind and solar grew by 16% in Minnesota from 2015 to 2016. Looking for a new job? Six coal plants that pollute the air are planned to close in the next few years. Solar is growing all over the state too. Have you checked into a solar connection for your home? Thanks largely to effective energy policies that increase renewable energy and energy efficiency in our energy mix, Minnesota has one of the strongest clean energy economies in the nation. We’ve already developed over 15,000 clean energy jobs that pay on average 42% more than Minnesota’s average wage. Since 2000, clean energy employment grew 78%, compared to the state’s total job growth of 11%, and now provides over $1 billion annually in payrolls, as well as millions of dollars in taxes to cities and counties across the state. Learn more about climate change and renewable energy at www.Fresh-energy.org. The Caring for Creation ministry at SJTW shares information on how we all can do our part to care for Mother Earth. If interested in joining please contact Steve Kriz.